Jim McGinty, the long-term owner of the old, run-down Alcazar Theatre building at 609 First Street, claims that it is the most photographed historic structure in Snohomish. “So why change it,” he asks? Courtesy David Dilgard's "Mill Town Footlights"
David Dilgard, Northwest History Specialist with the Everett Public Library, describes in his book “Mill Town Footlights” a similar box-house style theater in Everett (no longer standing) that featured such attractions as Oofty Goofty, The Hard-Cheeked man, “and it had nothing do with the comedian’s face,” Dilgard writes, “indicating instead the portion of his anatomy that received a multitude of kicks and slaps – an indispensable part of variety hall entertainment.” By the close of 1893, however, the economic boom had gone bust, the wooden stages of the area went dark, and the Alcazar Theatre is not listed in the Polk Directory again until 1903. 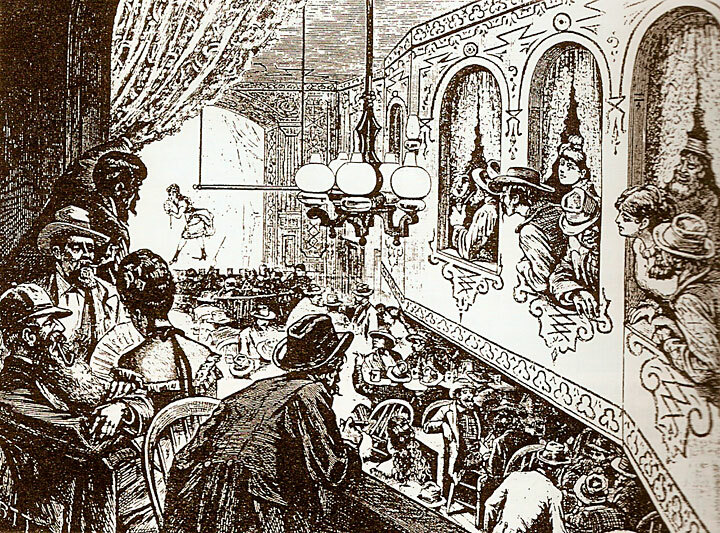 The Snohomish Historical Society archives has one theater program in its collection from the Alcazar of a production presented by the Snohomish Public Library, on April 8, 1904, titled, “The Mystic Midgets.” The program boasts: “100 Of Our Talented Young People.” And in 1906, a young Al Jolson, new on the vaudeville circuit, moved his act to the Alcazar when his booking in Everett fell through. Charles H. Crippen is listed as the proprietor of the theater in 1909, and three years later the address, 609 First Street, is a listing for furnished rooms, which were on the second floor. 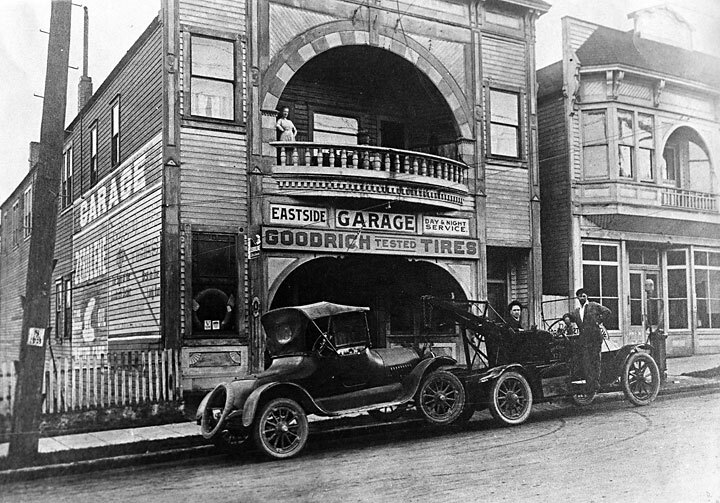 We are getting close to the estimated date of our historic image, picturing the building as the Eastside Garage. Through the years, McGinty has taken expensive steps to preserve the building, first by adding a concrete foundation, and then a few years ago, he replaced the roof. Recently, Mike Odell and Gayle Szalay opened an antique business on Fridays through Sundays. As you enter their shop, look up to note the red horseshoe shape structure in the ceiling – it marks the location of the theater balcony! And just across the street, you can stop in at Tina’s Manor of Wine for one of her frequent wine tasting. So fortified, you will be ready to pose for the camera with the old Alcazar Building in the background. Feel free to imagine what it would be like if were a theater again. Alcazar Building, 2011. Currently owned by Jim McGinty, who lives next door, the rare historic structure has been in his family since the 1960s. It is home to an antique store these days, open only on weekends. “Alcazar” is a Spanish term for castle or palace, which was borrowed from the Arabic “alqasr.” Our local historic treasure could have been named after the famous San Francisco’s Alcazar Theater, built in 1885. Published March 16, 2011 in the Snohomish County Tribune. This entry was posted in Posts and tagged Alcazar Theater, Snohomish WA history on March 16, 2011 by warner. I have been fascinated with the old opera house, have read a lot about it, but I am most curious about the building now attached to the left side of the opera. It looks like an old hardware store with the VEEDOL LUBRICATION and the BUY QUALITY signs on the front and the old tractor sitting out front. Can you tell me what was this building, was it built in this location, and if so when was it built? One photograph of the building I have seen, the photographer referred to it as a country store, but it looks more like a hardware or auto parts store than a country store. It used to have a old coke sign over the front window but I assume that was added by the antique people. Would appreciate a reply by e-mail if you know some of the buildings history. Thanks. Thanks for your question Ben. The building on the side was added by the Crippen Family in order to drive cars into the building. In other words, the structure was built with large, double garage doors, which are no longer there. 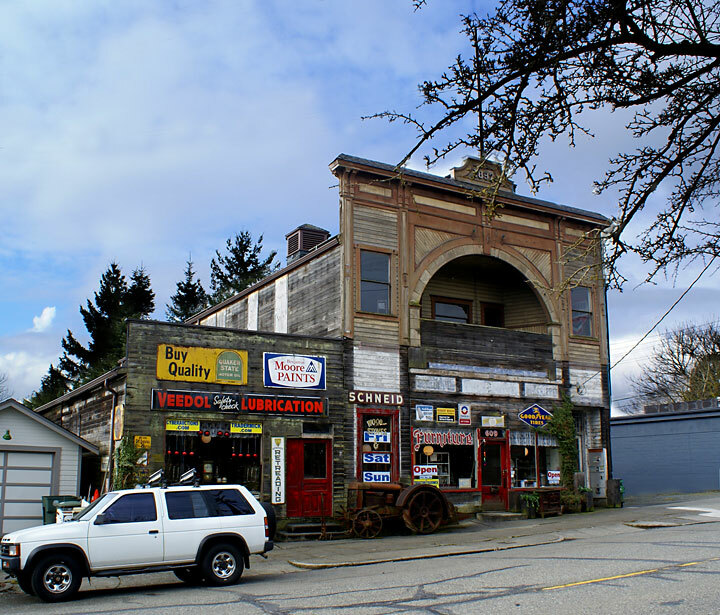 I was contacted by a family member whose parents owned the Snohomish Exchange in the 70s — yet another life for the historic structure — perhaps considered a ‘country store’ by some. The family members may know where the Moore Paint sign came from and if their parents ever considered their business a hardware store. Stay tuned. Since this was published, Tina’s Manor of Wine closed and Snohomish’s own Dream Dinners purchased the building for its home office.